Volvo Cars is a global car brand with sales in about 100 countries. From their HQ in Gothenburg, Sweden, they coordinate and develop all marketing efforts, including events and exhibitions. Lexidor is proud to be a supplier of screens, signs and displays for Volvo Car events. Thomas Dahlberg, Project Manager Exhibitions at Volvo Cars, has a hectic schedule. With over 60 days spent traveling every year he has visited many, many exhibition centers and trade fairs in the world. – Making a statement and cutting through the noise during international events is a challenge for every exhibitor, he says. Some people might think the answer lies in the bold and spectacular. However, to get the results our company wants, the details are just as important. The nuts and bolts, if you like, must be in place to support the broader message. 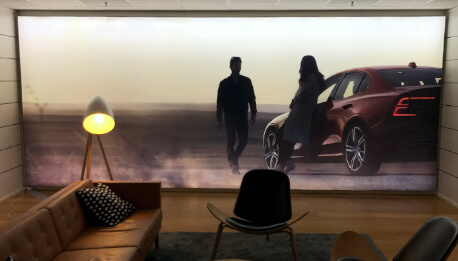 When coordinating and planning events for Volvo Cars, one of the major responsibilities is making sure all visuals and messages stays exactly on brand. 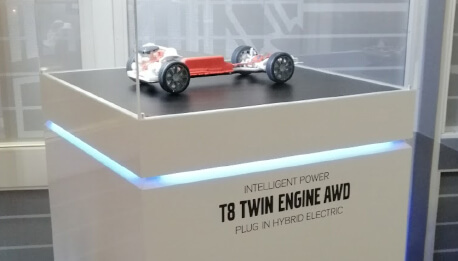 – For this project, we wanted to present our T8 Twin Engine AWD driveline in a different scale. We also wanted to decrease the costs of each individual showcase through a more mobile, transport-friendly solution. – Lexidor, using their knowledge of material and techniques, was a phenomenal and creative partner in helping us achieve our project goals. Following our project timeline minutely, they optimized 3D models and developed physical display units that reduced weight and transportability tremendously. In the end we received a much better solution than we envisioned.